FREE local delivery with any order has been on offer from us at Angell Pets for quite some time. 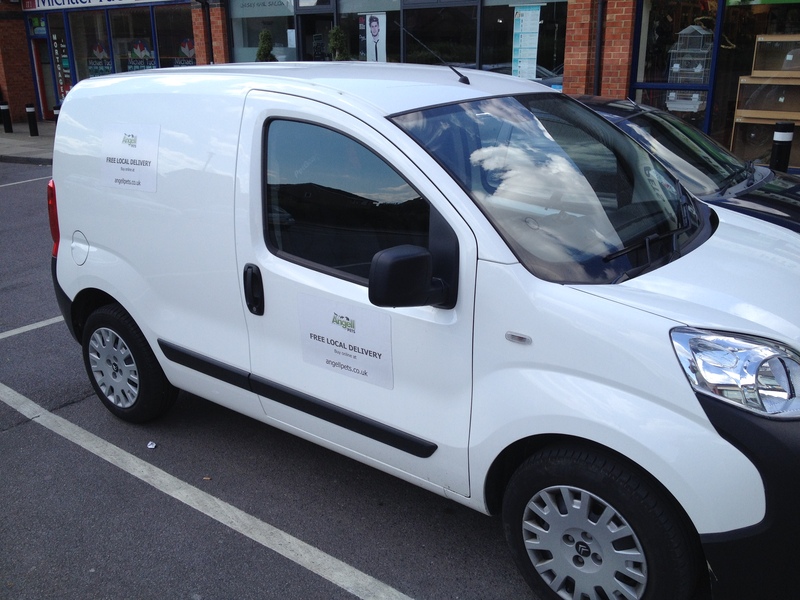 We are now able to extend this FREE service to Cheltenham and the surrounding areas. Delivery of any item in the GL1,2,3,4,50,51,52 and 53 areas is now FREE. Orders can be placed over the phone or from our on line web store. Orders on line are by card but COD is available for telephone orders. This also means we are now able to offer livestock deliveries to these areas, as all FREE local delivery runs are with our own vehicles (we do not post or courier animals). Simply choose from our stock on line and call to arrange payment and delivery. This gives us the opportunity for us to check you have thought through your purchase and for you to check us out and be sure of what you are buying. If you need to arrange FREE local delivery at a specific time, call us at the shop and order over the telephone and we will try to arrange delivery at a time that suits you. Unless it is really busy we can usually accomodate. Please note we do not usually deliver at weekends. I work seven days a week and do FREE local delivery in the evenings during the week. My wife insists I have some time off! So sign up on our on line store to receive FREE LOCAL DELIVERY of all your animals needs. Chile rose tarantula care sheet. Chilean rose taratulas are a medium sized tarantula (body 7.5cm, leg span 15cm) from southern Peru and northern Chile, on the edges of the Atacama dessert. This docile spider ranges in colour from grey, through pink to a vibrant copper red. Females are thought to live from about 20 to 40 years. As with most tarantulas, males live shorter lives, sometimes due to their expiring a few months after maturation, often through becoming a post coital snack for the female. Males have smaller bodies and longer legs. Females remain pretty much in or around their burrows throughout their lives, whereas males roam around when adult, looking for a female. Although a burrowing spider in the wild, captive Chilean rose tarantulas rarely construct viable burrows, although they do appreciate somewhere dark to hide. In captivity they feed almost entirely on crickets and other insects (from which they derive most of their water) although larger spiders will eat the occasional small mouse. Adult Chilean roses require an arid environment. They appear to despise damp substrate and should never be misted. However very young spiderlings do require some humidity. Their substrate must be regularly dampened or they will quickly desiccate and die. This is thought to be due to the exoskeleton taking time to “toughen” and become waterproof. As they age the substrate can be allowed to become progressively dryer. As they grow a suitably sized water bowl can be introduced. Too big and the young spider will fall in and drown. Adults, whilst liking it dry, do require a water dish for occasional drinking. 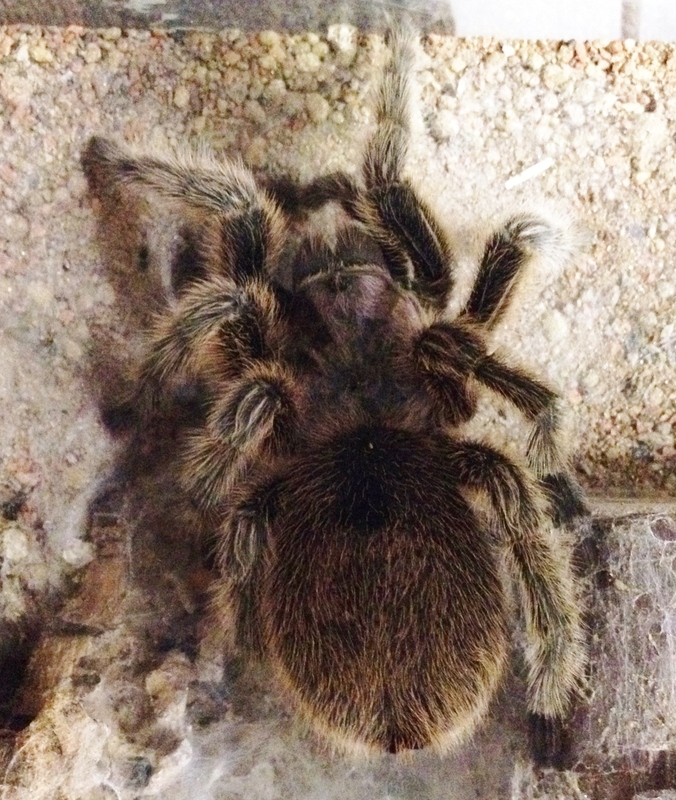 Chilean rose tarantulas are probably one of the easiest tarantulas to handle because they are fairly slow moving and rarely bite, giving plenty of warning first. If they do bite it is usually a dry bite (no venom injected) and in the extremely rare cases where venom has been injected it has proved to be the equivalent of a bee sting. HOWEVER people can be allergic to bee stings and you would not know if you were allergic to a spider bite until after you had been bitten. And who wants those big fangs stuck in them anyway? As with most new world tarantulas the biggest risk is from urticating setae (the hairs). These either brush off the spider when handled or are rubbed off on cage appointments or by the spider itself. They penetrate the skin causing irritation, which can be quite severe in rare cases. Getting these hairs in the eyes requires hospital treatment. So NEVER rub your eyes after handling a tarantula or anything it has been in contact with and as with all animals ALWAYS wash your hands after handling. The biggest risk when handling any tarantula is to the spider itself. Any fall of more than a couple of inches is potentially fatal. They are delicate creatures and can rupture internally and externally. A lost limb may well heal and eventually regrow but a ruptured body, whilst sometimes treatable, is more often fatal. Even a regrown limb can cause the spider problems with later moults. All in all it is best NOT to handle tarantulas, you don’t get any irritation or bites and they stay alive. The Chile rose is probably the hardiest species in the hobby as well. The environment they come from is dry, very hot during periods of the day and very cold during periods of the night. The can tolerate quite wide ranging temperatures in the short term. Generally the normal household temperatures in the UK are sufficient for a Chile rose and no additional heating is required. Obviously if you keep the spider in an unheated room throughout the winter a heat mat would be required. For spiderlings we use coir as a substrate. It can retain some moisture for raised humidity and is light weight so will not bury delicate spiderlings. For larger individuals and adults I prefer to use a more natural looking substrate, something like Lucky Reptile red clay sand bedding or desert Bedding and construct a more natural looking terrarium. That is only my preference however, you may prefer something a bit more utilitarian and that’s fine. The only thing I would point out is that if the substrate is too damp the spider will spend all of its time on the side of the enclosure to keep of it. For hides you can use whatever you like from broken plant pots to fancy resin hides, it’s up to you, the spider just wants a dark hole to hide in. I would avoid anything too heavy and unstable though, you don’t want it to crush the spider if the enclosure gets knocked. 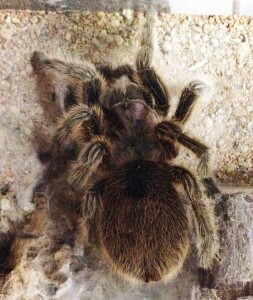 Chile rose tarantulas are notorious for stopping feeding as adults. They are reputed to have not fed for up to two years, although the longest I have experienced is just over 6 months. This can worry less experienced owners a bit. If you have an adult female and she looks in good condition I wouldn’t worry if she stops feeding for a while. If you have a youngster and it stops feeding it is probably getting ready to moult. We feed all our spiders weekly. If the following week there are stiil insects in the pot we remove them and stop feeding. Generally the spider will moult within two weeks. With larger spiders you can see the new skin growing through exposed areas of the old skin (it goes darker), however this is not obvious on smaller spiderlings and keeping track of the feeding habits is a must. Do not leave crickets in with the spider whilst it is moulting. Often the spider will delay the moult in the presence of crickets etc. and when it finally does begin the process the crickets have an easily accessible meal whilst it is incapacitated. Following a moult the spider will remain soft and vulnerable for quite a while, so don’t feed for at least a week. As with all our animals our Chilean rose tarantulas are captive bred, normally in this country and are not taken from the wild population. There are lots of reasons for this but the two most important to us are wild animals are likely to have parasites and/or infections and we have no control over how they are harvested. It could have been done responsibly, a controlled amount of individuals taken from an area that is then left to recover before more are taken or as is often the case, a businessman could have paid locals peanuts to collect as many as possible in a short period of time leading to the critical reduction in numbers of a species in a locality that may never recover. Always buy captive bred animals, they are generally more expensive but worth it. Balkan green lizards (Lacerta trilineata) are part of a group of related species ranging across Europe and western Asia. The eastern lizards of this grouping are slightly larger than their western cousins and a bit bolder too. This aside, care is very similar for all species. Balkans have a reputation of being less damp tolerant than some of the other species such as Lacerta viridis. We would not recommend keeping more than one of these lizards in an enclosure. Males will fight and females, whilst more tolerant, may do so as well unless the enclosure is quite large. Keeping a male and female together outside of breeding may also risk injury or stress to the smaller female as well, if she cannot get away from him.They have been kept together succesfully in a suitably large enclosures by experienced breeders but why take the risk? This care sheet is aimed at the beginner/intermediate keeper and does not cover keeping large breeding colonies which require very large enclosures (up to 20m2 in some cases. Green lizards can be kept outside through the summer but I am not covering that here. Needless to say cage security is a big issue with keeping them outside). We would recommend a wooden (or glass) vivarium of around 30″ – 36″ x 18″ x 18″. You can use a smaller 15″ cross section but I just find that restricts the view and reduces the lay out a bit. I do like naturalistic, display vivs so tend toward larger vivs for display purposes. A variety of substrates can be used. Some people have used sand – I don’t. The risk of impaction is higher and whilst easier to seive I find it will smell dirty, quicker than other substrates. Beech chips are fine but I find them a bit utilitarian for my taste. Orchid bark chips work well (if you are worried about swallowing of bark pieces then use a coarser grade). There are several newer products coming along all the time that work really well. I like Pro Reps Tortoise life substrate for these lizards. I place some at one end of the viv and blend into orchid bark for the other two thirds, banking this up over a piece of cork bark which acts as a hide and as structure for the layout. Damp moss under the hide will produce a more humid microclimate that helps with shedding. The additional depth of orchid bark acts as an anchor for upright fake plants (Exo Terra and Komodo’s Boston Ferns for example). A few well placed rocks (I use Red Jasper) improve the look further and help keep everything in place. the Torrtoise Life encourages natural digging behaviour. You could use something like Tortoise Life (a clean, pathogen free “soil” type substrate) across the whole viv. Green lizards like to dig and burrow so make sure it has some depth to it (5cm is OK). Green lizards are diurnal so require UVB lighting. A 5- 6% tube or compact UVB lamp will be sufficient to ensure production of vitamin D3 and so uptake of calcium from the diet. This will avoid metabolic bone disease and some other nasties that these li\zards would otherwise be prone to. They will also benefit from a basking spot lamp. We use one that produces some UVA light as this helps promote a natural circadian rhythm. Don’t have one that is too powerful for the size of your vivarium and ensure that the lizard cannot come into contact with the lamp (a guard may be necessary to ensure this). Incadescent lamps produce a lot of heat as well as light so (especially in a wooden vivarium that helps keep heat in) a method of ensuring that the lamp does not overheat the viv is essential. This normally means a dimming thermostat. In addition to a basking spot lamp we use a heat mat to provide background and overnight heat although in a hot summer this can be switched off. The basking spot (on during the day) should not exceed 40C at the hottest point (a rock directly under the lamp would be good) and the cool end of the viv wants to be around 20C during most of the year. 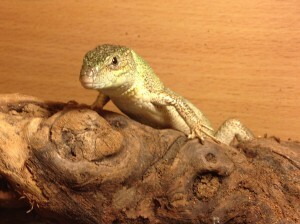 The lizards will benefit from a lowering of temperature during the winter however. If you are looking to breed this is essential to stimulate breeding behaviour in the spring. when the temperature increases again. Overnight the temperature will drop with the basking lamp switched off. This is not only acceptable but desirable to reproduce natural conditions. Around 20C at the hottest point overnight would be good. Maintaining a gradient across the viv to allow thermo regulation during the day is the key. A thermometer is an essential piece of kit. A basic dial type is sufficient. I don’t use these. Not because they don’t work, they do but because I have a lot of vivs and that’s a lot of thermometers, I prefer to use an infra red “point and press” thermometer. More expensive if you only have one viv but cheaper if you have lots. Much more accurate too as you can take surface temperature readings at any point across the temperature gradient (hot side to cool side). If you don’t have one of these then two dial termometers, one at each end will do. Just remember that the temperature on the back wall of your viv will be less than that directly under the basking lamp so a reading of 30C is sufficient. Adjust whatever thermostat you are using to the reading you get from your thermometer and don’t worry too much about what the termostat setting says, worry about what temperature you are actually acheiving. If using a heat mat I would, in this case, place it on the wall of the viv rather than the bottom. The substrate will be too deep and will insulate the heat mat, possibly to the point of creating a dangerously hot spot if a fault develops in the mat. If you wish to use a ceramic heat emitter instead of heat mats that would be fine but again make sure the lizard cannot touch it – they get very hot to touch. Green lizards are insectivores. We use a wide variety of cultivated insects. Crickets form the mainstay. They are very active and encourage natural hunting behaviour. We vary these with locusts, some morio and mealworms and occasional waxworms and fruit beetle grubs (the smallest ones we can find). Dust the insects with calcium and occasionally with vitamin powder containing D3 (We do this once a week) . Since we feed our insects throughout the week to keep them alive on our shelves for our customers, ours are gut loaded anyway so we do not have to worry about that. Just remember, whatever you feed your insects you are feeding to your lizard in the insect’s gut so you can supplement your lizard’s diet that way. Do not use insects captured from the garden. They could carry parasites or diseases, could have been feeding on a neighbours plants that have been sprayed with something etc. I know people do it and do not have problems. However my response to this is my mother in law smokes 20 cigarettes a day and is in her eighties and in good health, However I wouldn’t recommend it to your children. Enough said. A water dish is obviously essential. Occasionally a lizard will use it to bathe in as well as to drink. Make sure the water is changed regularly as in the warm environment bacteria will grow very quickly and these lizards do occasionally use the water bowl as a toilet! Green lizards are fast and can be defensive. Handling is not always easy. If you lack confidence then use a glove until you gain some. It is harder to hold the lizard with a glove on but easier to catch it in the first place so I wouild recommend removing the glove once caught. Holding the lizard across its shoulders with the first two fingers and under its chest with the thumb means is cannot get away and cannot bite. Always grab the lizard near its head when catching it and NEVER grab its tail. Like a lot of lizards (although no where near all) they display caudal autonomy – the ability to “drop” the tail. This is a defence against predators. Whilst the predator (or you) are stood looking at the still wriggling tail the lizard has hot footed it to safety. Whilst in green lizards the tail does grow back it never grows back looking as good as the original and losing its tail in this way is stressful to the lizard and to you! Green lizards can all suffer from an highly infectious disease called viral papillomata which can appear as a black growth on the skin or in the mouth. It is always fatal, although it can take years to develop. This is really a disease of wild populations and a lizard obtained from disease free captive stock will not get this condition unless intorduced to diseased individuals. My first reptiles were a pair of European Green lizards (Lacerta viridis). I obtained them seperately. The second one had the disease and subsequently both died of it. This was however, “Ahem,” over 40 years ago so both would have been wild caught individuals and these days, thanks to improvements in care, restrictons in capturing and moving wild animals and excellent breeders any you find for sale are likely to be disease and parasite free, captive bred lizards. Spot clean daily – take out any poop you can see with a bit of tissue. If you do this daily and are thourough, you should only have to replace the substrate every three months or so. If you do not do this regualry then the vivarium will start to smell quite quickly and the substrate will need replacing more regularly. After removing the substrate disinfect the vivarium with a good quality reptile disifectant. As we have a wide variety of animals (reptiles, mammals, birds) we are currently using F10 as it is safe for everything we stock (obviously not fish!!!) but there are others avaiable. Do not use household disinfectants. Many contain toxic phenols (the distinctive TCP smell you get in some famous household disinfectants). As already mentioned, clean the water bowl regularly (daily is best but at least every two days). This should be disinfected each time as this is likely to prove the dirtiest part of the set up (everything will collect there, lizard poop, drowned crickets, bits of shed skin, bacterial scum etc). It shouldn’t really need saying but I will say it anyway – always wash your hands after handling your lizard or anything inside the vivarium. Reptiles can carry E.coli and salmonella bacteria and you really do not want a dose of salmonella. In the weak it can be fatal but even in healthy individuals it is embarrasingly unpleasant, incredibly painful and debilitaiting. Don’t take risks, get some anti bacterial hand cleaner. July is here and so are our fantastic summer offers from our wholesaler. Lots of great discounts at sub supermarket prices and with FREE local delivery as well. CLICK THE LINK for the offers or visit us online to place your order.